The OddBlog: The Hunt for Nessie is Renewed! The Hunt for Nessie is Renewed! Every year about this time, the Loch Ness Monster -- known affectionately as "Nessie" -- seems to rear her possibly prehistoric head. While skeptics decry the timing as suspicious, and specifically meant to drive tourism to Scotland's most famous loch, intriguing evidence sometimes surfaces. Now, scientists are preparing to use DNA research to determine whether or not some unknown creature(s) truly exists within Loch Ness -- kind of. Evolutionary genetics professor, Neil Gemmell of New Zealand’s Otago University, freely admits that he is using the legend of Loch Ness to fuel interest in his expedition, but says he is keeping an open mind. The DNA research trip is expected to find unknown forms of marine life, for which Loch Ness is also known. The word, "cryptozoology" literally means, "the science of unknown animals." The legend of a lake monster in Loch Ness dates back at least 1,000 years, and is generally thought to have originated with Saint Columba, who stopped Nessie from eating a man swimming the lake. Some sources note that a Northern Scottish tribe was actually the first to record a strange, flippered beast in drawings -- some 1,000 years before Saint Columba's time! Most Nessie sightings have occurred after the 1934 Inverness Road was built. 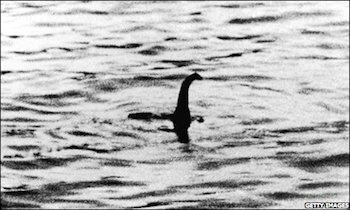 And while the Loch Ness Monster has suffered its share of hoaxes and ridicule, innumerable photos and film have confounded researchers throughout the years. Scotland's tourism industry is unlikely to suffer due to a renewed interest in Loch Ness, but that was hardly on the minds of early observers, or Professor Gemmell. Cryptozoology is a fun and exciting scientific endeavor, and although we doubt much will come of the DNA search insofar as Nessie goes (for numerous reasons), we hope it draws more researchers into the field. According to RT, 2017 was a highwater mark for Nessie sightings in the 21st-Century.